This article is written by 4th year Forest Resources Management student, Yu Chen. 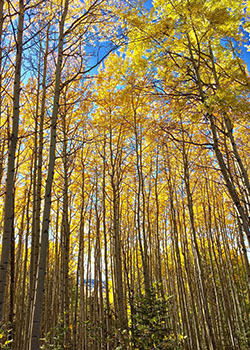 Yu is currently a student in the Master of Sustainable Forest Management program. Learn more about the Forestry Co-op program. When I began my overseas study of Forest Resources Management in the Faculty of Forestry at UBC, I was confused about my future career and felt completely helpless. But finally, like a lighthouse in the pitch-dark, the Forestry Co-op program helped me find my path, and all my doubts gradually disappeared. Students can get great opportunities to alternate paid work terms with academic terms throughout their degrees. The diversity of the Forestry Co-op work term positions and the professional training experience received during co-op workshops make co-op students well prepared for the workplace demands. I am excited to say that Co-op has given me the opportunity to travel and work in different cities in British Columbia, while learning valuable skills and gaining job experience. The co-op program not only gives me an edge against graduates from other institutions, but being in the co-op program has greatly helped to enhance my resume and interview skills on a continual basis. My co-op experience started as a research & program assistant in the Faculty of Forestry. For me, it was a suitable transitional period before I stepped off campus and got involved in the real forestry industry. The project I assisted for the Asian Strategies research group is called Changing the Forest Landscape in China. I was responsible for collecting and analyzing data on a 15-year investment and implementation project for forestry in China. I also had a chance to interact and communicate with summer student groups through the UBC Vancouver Summer Program, where I succeeded in organizing and implementing planned summer program events under stressful circumstances. That was an unforgettable summer, where the biggest achievement was gaining a solid understanding of international forestry policy and sustainable forest management. Working on campus gave me the opportunity to improve my academic research and critical thinking skills. 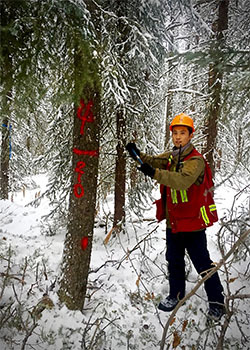 In addition, working in the Faculty of Forestry had allowed me to learn a great deal about the forestry industry in the world, particularly in China and Canada. I accomplished my goal to step into a real industry environment in three consecutive work terms as a Forest Technician with Forsite Consultants Ltd in the Fort St. John division. This is an entry-level job for students on the path of becoming a forestry professional, and I was excited to become familiarized with the basics of forest engineering in the north interior of British Columbia (BC). Long-term work experience indeed provided me with great opportunities to be involved with various responsibilities, and to progressively improve my own abilities. More importantly, I was really excited to experience this field work in all seasons! The duties that I regularly performed were revolved with Multiphase Timber Development projects directed by BCTS and CANFOR. My responsibilities included Harvest Block and Road Layout, Timber Cruising, Riparian and Ecological Assessment, Timber Reconnaissance, GPS Traversing, Data Management, etc. Extensive field engineering work experience served to fulfill and round-out my work-term learning objectives, which will also significantly benefit both my future academic and forestry career pathways. By now, my coop work terms have proven to be very beneficial. I successfully achieved my goal to enhance my filed-based experience and gain a much better understanding of the Forest Industry in BC. My co-op work placement with Forsite has definitely taught me a lot about forest operation, planning and multiphase timber development in a professional setting. I feel as though my life has been enriched in an even more momentous way since moving to Northeastern BC. Through these work terms, I have unlocked my interests for fishing, hiking and nature, which had simply been lying dormant in my urban-oriented mind before. Sometimes my mind flies back to those great Rocky Mountains, reliving the times when I crawled my way out of the waist-deep snow, climbed 10-feet blowdown piles on a 60 percent slope, and completed 10-cruising-plots a day. All things are difficult before they become easy and bring you comfort, so that is why being patient is necessary to find success. I now won’t feel anxious and puzzled when things are tedious or frustrating occasionally, because I always clearly know I am in a process of growth, improvement, and becoming mature. Studying abroad really brought out my independent nature and offered me a great opportunity to explore this beautiful nation, while discovering the curiosity and excitement that I possess. Participating in the Forestry Co-op program has made everything more interesting and enlightening. A benefit of being a co-op student is the opportunity to discover yourself while gaining an understanding of a career or an industry in the ‘real world”. Being in a new workplace, in a new job position by yourself can be overwhelming at times, and it tests your ability to adapt to diverse situations while being able to solve problem and polish you critical thinking. I indeed gained a broad range of technical skills during my work terms which, when compared with my academic knowledge, will be valuable in any workplace. I really want to thank the Forestry Co-op program, which helped me explore career options and build networks for my future employment. Undoubtedly, when I finish my study abroad with this valuable co-op work experience, I will return with a new perspective on culture, language skills, a great education, and excellent professionalism. Needless to say, all of these are very attractive to future employers. The Co-op program is great for students who are not exactly sure what they want to do with their degrees. You will be exposed to various opportunities to work in different fields, or specific places you are fond of, and it’s fantastic to have the chance to live in new cities and explore different ways of life and cultures. From a professional perspective, co-op opens many potential opportunities through making business contacts, and will ultimately improve your resume, cover letter and interview skills, and provide you with a feel for the real life job market. To conclude, my co-op experience has had an impact on my overseas study life in an extremely positive way. Taking different co-op work terms added practical and processional experience to my degree that could not be gained through classes. In addition, my long-term work placement broadened my horizons and taught me how to become a diligent and professional forest technician. I would strongly recommend to all 2+2 students to be involved in this amazing process of being able to “Stand Out”, as it truly is the best education you can receive to compliment abroad studies.